Little Marvels' philosophy is that one size doesn't fit all, said owner Daniela Slepak Caceres. Slepak Caceres, a former teacher with a master's in curriculum from DePaul, wants the new school, 3045 N. Lincoln Ave., to have the flexibility to try different curriculums and methods for kids, she said. "When you put yourself in a box, you have now here to go," she said. She respects the various methods and thinks that they work for many children, she said. But her experiences at schools and as an educational consultant showed that too many rules around learning can constrict certain kids, she said. The small school, which can enroll up to 67 children, will adjust to each student. "At the end of the day, good teaching is just good teaching," she said. "Whatever you call it, whatever label, common sense works better than anything." In addition to personalizing teaching methods, Slepak Caceres wants to build a community around Little Marvels. 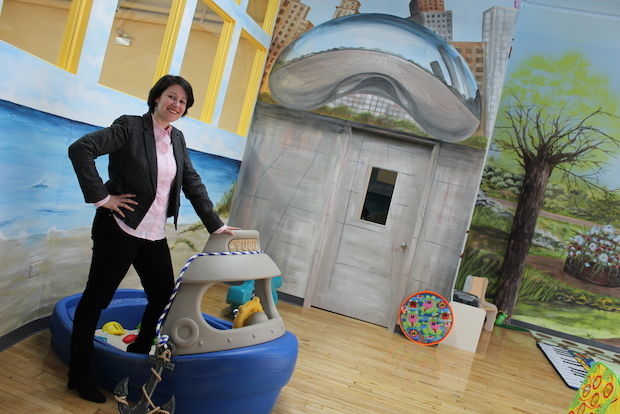 The school, which is painted with little superhero characters and Chicago landmarks, includes a nursing room for mothers or fathers to stop by and bond with their babies. She also plans to talk to local yoga, martial arts, dance and foreign language schools to implement additional programs. "It gives children the chance to figure out what their strengths are," she said. The school will have classes for infants, toddlers, preschool and kindergarten, with at least two teachers for each class. It's still waiting on final licenses and hopes to be up and running next month. For now, it's hosting open houses on Saturdays. The next one is Saturday, April 26, from 10 a.m. to 2 p.m. Tuition ranges from $390 for two half-days a week for kindergartners to $1700 for five full days a week for infants. Little Marvels is taking applications now.